So as I mentioned before, Matt had been working on patching a ton of places on the roof of the boat in hopes of getting a handle on the leaks that we have. He has been applying a primer, layer after layer for about two weeks now. Then sanding edges and in the next few days he will paint over all the primer with a matching paint to our boat color. In a perfect world all the leaks will stop and we will live a gloriously dry happy little life in our boat. If only it were that easy. I’m not one to carry on about the weather but when you are living on a boat that leaks it kind of happens naturally. I watch the ten day forecast like a hawk. With all of the warm sunny summer weather we have had the wood of our boat has dried out. This is all fine and normal, but when it rains it means more little cracks for water to enter. It seems that every August right about now, a little summer storm always rolls through the San Juan Islands. This year was no different. We went to bed knowing that it was going to rain but I think we were both hopeful that all the patching would slow the water down and maybe make it a nonissue. Matt was less hopeful than I was mostly because he had been doing all the work and knew that he still had more to do before it was done. This ill-timed storm was not fitting into his boat work schedule. We were each hoping for a miracle. Point being, we didn’t do any prep. At 4:30 in the morning it started raining hard. It sounded like marbles hitting the boat. So loud and so much water. It sounded close. Like on my pillow close. Sure enough, three leaks sprang above our bed. We were up. More leaks in the room and more than a few in the kitchen. In total I counted twenty-two leaks. We had towels and buckets and mason jars everywhere. It was a full time job. Jars filled quickly, towels needed moved, new drips came out of nowhere. I was so annoyed. I had this total little tantrum in my head over the whole thing. I was personally offended that it was raining. My bliss of sunny summer days on a boat came to a screeching halt and I was pissed. What I did know that morning as I ran around for four hours in a less than a jovial mood managing buckets and towels was that we needed to declutter our boat again and get moving on projects for the winter. I spent the better part of the day cleaning out cabinets, closets and dressers. With colder temps and more moisture coming, it’s time to live with much less again. 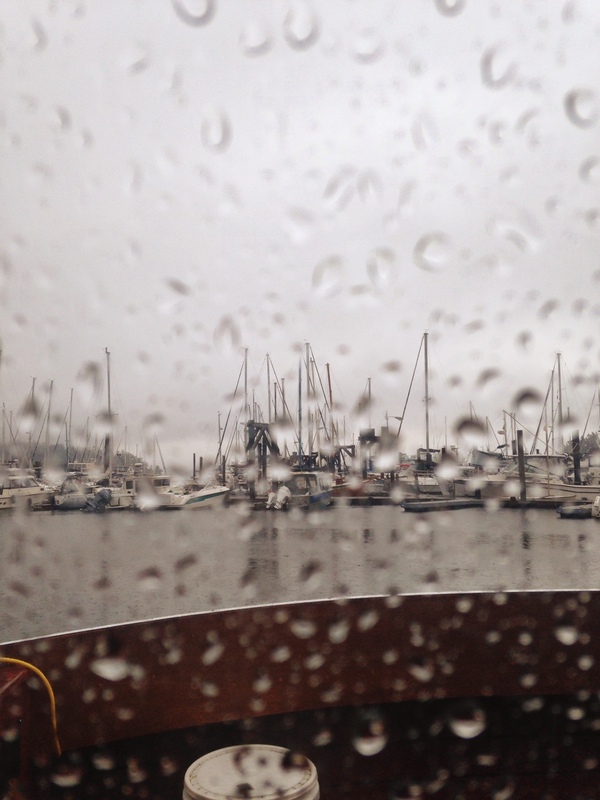 Everything is wet on the boat in the winter so there is a greater risk of items getting ruined with water or mold. It feels funny to have to live a different way for the winter months but it’s necessary. I can honestly say that in retrospect, that day of being pissy over the rain was the kick in the shorts I needed to better understand exactly why we are choosing to live this way. It would have been so easy to let that become all consuming leading to negativity about so many aspects of our daily life. It would have been an easy path to self destruction and I would have had all the right stories to support why this didn’t work. I want this to work though. I like our life on this boat. I like the environment we live in and I actually thrive off of the physical challenges created by living on a boat. Living this way is definitely making me a stronger person…. and a little jealous of all you people with roofs that don’t leak. This entry was posted in lifestyle blog and tagged adventure, boat, family, lifestyle, marina, minimalisim, personal growth, San Juan Island, weather by wildrose. Bookmark the permalink. I would be interested in hearing more about the show. My name is Laura and I’m a television producer at Intuitive Entertainment – we are a TV production company in Los Angeles and we are currently developing a new show about parents who raise their children in interesting or unexpected ways. I came across your blog and was hoping to speak with you about potentially being part of the project. I believe you’ve been reached out to in the past for television projects, but If you’re open to talking, I’d love to set up a time to chat. Thanks a lot!